My old plan cost me $20 a year for 80GB (without Google Drive). It's no longer offered, but I can continue with it if I wish. 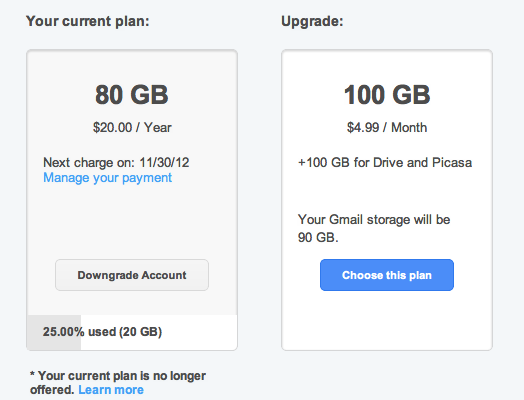 The equivalent new plan would cost me $60 a year for 200GB (extra storage largely for Google Drive). Curious. For now I'll stay with my old plan and the "free" 5GB of Google Drive storage. The numbers are better if you consider what I would actually use if I committed to Google Drive. I am using 20GB and thus paying $1/GB for storage I truly use. It may be that Google's prior prices were only profitable when most of the storage was not in use, which was likely given limited use options (primarily Picasa). A 100 GB option is not available. Sounds like what I'm hearing about Google Apps. On the one hand I don't love my 20% price hike, but on the other I'm happy Google wants cash. I'd much rather pay for Google services than get them for "free".